The IMAGE mission is designed to "See the Invisible" by means of innovative remote sensing of the Earth's magnetosphere and its plasma populations. At Rice University our IMAGE research is part of the of the Rice Space Institute . 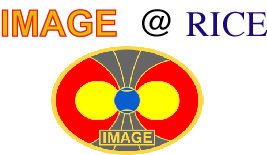 "IMAGE @ SWRI" | "IMAGE @ GSFC" | IMAGE theory group @ Rice | IMAGE outreach program "POETRY"
FLASH! Jerry Goldstein, IMAGE scientist, was recently chosen for the AGU "Macelwane" award and for Popular Science's "Brilliant 10" young scientists of the year. Congrats JERRU! At Rice University we participate fully in the IMAGE mission, both in science (working with the theory group) and the RPI group, and in public outreach (as part of the "POETRY" (Public Outreach, Education and Training, Reaching Youth program). Rice University, with funds from the IMAGE mission, produces a public outreach CD-rom "SPACE WEATHER" . This CD is available FREE for educators (teachers, museums, and home schools). $5 for postage and handling is requested, but not required of Title 1 schools and schools with 70% underserved populations (send a letter on school letterhead). Send a request to: connect@space.rice.edu . It is also given away free to all teachers who request a "Sun-Earth Day" packet from SECEF. Those with very fast internet connections can download the entire disk image, mount it, and install it yourself. Right-click (or option-click) HERE to download the disk image. But BEWARE - it's 646 MB! The Space Weather CD contains all the material in the "Poetry" web site, plus the popular "SPACE WEATHER" module from the "SPACE UPDATE" CD-Rom from the "Public Connection". It also contains teacher resources, student activities and other materials explaining space weather and its effects. Our "Space Weather" module has much of the same material as the popular "Space Weather" website at NCAR, which we helped develop and maintain. However, since our software updates from within a captive "macromedia" program, it is safe for a museum or school to use unattended. The users never get unimpeded access to the often inappropriate material on the web... just to the best of space science. Auroras in Both Polar Caps Conjunction aurora movies from IMAGE and Polar, from the August 17, 2000 storm. Featured in the "Live from the Aurora" program on Passport to Knowledge. Download here in high resolution, with scales, (35 MB) and the simplified version (16 MB) which was shown on TV (Beware - these are large). Rice University is also developing IMMERSIVE DIGITAL SHOWS, in cooperation with the Burke Baker planetarium at the Houston Museum of Natural Science. "Force 5", which opened at the "Earth Theater" of Carnegie Museum of Natural History in November 2000 and at the Houston Museum of Natural Science in January 2001, features the power of hurricanes, tornadoes, volcanoes and space storms. These productions are done in conjunction with the "Globe Theater" project of "Museums Teaching Planet Earth" program. In 2002 the show "Night of the Titanic" opened, which might be the world's space weather event with the greatest loss of life... ! For more information or to order any of our earth or space planetarium shows, go to our planetarium spinoff company e-planetarium.